Travelling down is a bit more dangerous that going up, especially with crampons. I was the least experienced with crampon travel in our group so I held down the rear. Just off the summit was a nice view south of Lakes of the Clouds Hut, Monroe, and Eisenhower. The big snowfields we went up made good glissade practice because they had a gentle and protected run out. There was one section just below Lion Head with tricky footing, but we made it down to treeline without incident. After getting our final views of the Carters we started the steep section. This section was the trickiest part of the entire trip. The trail is steep, up to 70 degrees or more, and by now the snow was hard and very fast if you slipped. We took turns front pointing down the worst sections, using our ice axes for aid. But everything went well and we reached the Huntington Ravine Fire road and finally took off our crampons. We celebrated by eating some gorp and taking a big hit of water. An MIT student who was hiking out of Huntington came by and we all hiked down together, stopping for a shot of the Crystal Cascades before posing for the final group shot at Pinkham Notch. Inside we traded addresses so I could mail Bill the photos from this trip. 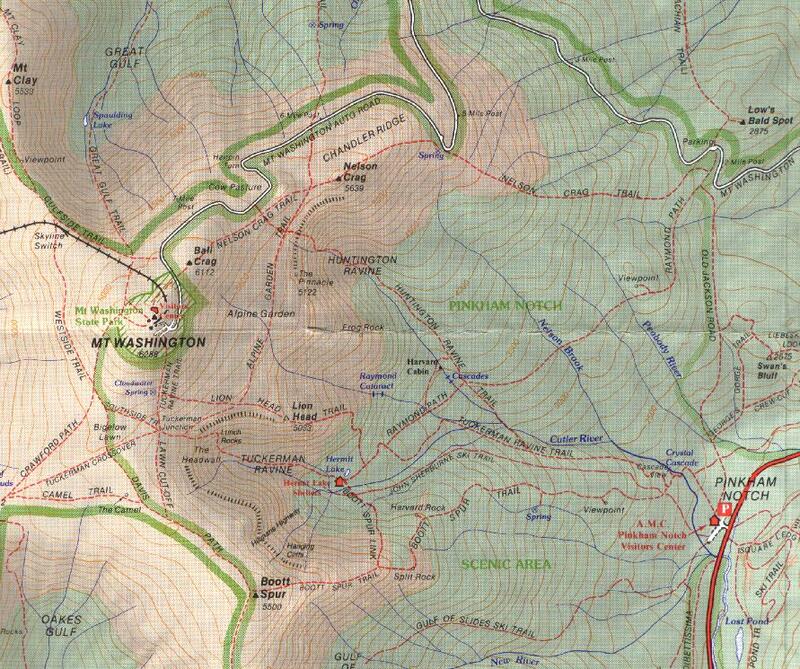 I picked up a map of Mt Washington to go along with my many maps of the area. In the visitor's center is a scale model of the mountain that we studied to find the new winter Lion Head route. It was about 4:00PM. All that was left was to take off my boots, hop in the car, and head home. I was drained, elated, awed, and very, very happy. May you all get a day like this one.